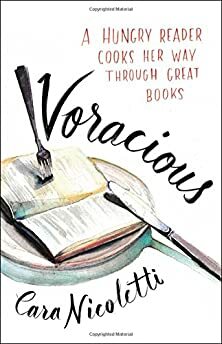 Largehearted Boy: Book Notes - Cara Nicoletti "Voracious"
Book Notes - Cara Nicoletti "Voracious"
Cara Nicoletti's Voracious is an entertaining amalgam of memoir and cookbook with a literary angle as she recounts the influential books of her life alongside recipes inspired by them. "Nicoletti turns both reading and cooking into eagerly anticipated visceral experiences." One of the greatest powers of food and literature is the way they both can transport me so completely to a specific time in my life. Much of my book Voracious is about this food and book-induced reminiscence—I will never read Rebecca without recalling the gutpunch of my first heartbreak, or smell a peach without remembering how Joan Didion pulled me out of one of my darkest periods. Next to books and food, music is the greatest nostalgia-provoker. This playlist, like Voracious, is driven by nostalgia for the phases of life I've left behind. The Smiths—"This Night Has Opened My Eyes"
The Smiths are my dad's favorite band, so my childhood memories sound like Morrissey. "This Night Has Opened My Eyes" always scared me, made me feel bad in my guts, but I loved it anyway. I felt the same way about In the Night Kitchen and actually, most of Maurice Sendak's other books, which are full of children thrown into dangerous, parentless worlds, facing creepy monsters and bad men. The books that scare us are usually the ones that stick with us the most and make us realize the power of the written word. I guess the same is true for songs, because "This Night Has Opened My Eyes" is still on my top-five list all these years later. In 1994, when I was eight, the album Life's Too Good by The Sugarcubes got stuck in the tapedeck of my mom's Volvo station wagon. It was jammed so badly even the radio refused to work, which meant that every time we wanted to listen to music in the car for the next year, we had to listen to this album. To this day, my mom will go apoplectic if she even hears Bjork's voice. I'll always have a soft spot for the album, though, particularly the song "Birthday," which reminds me of driving back and forth to my grandpa's butcher shop after school, where I would read The Little House On The Prairie series behind the counter for hours, with the song playing loops in my brain. The Police—"Canary in a Coalmine"
It was The Legend of Sleepy Hollow that taught me that the earth is in constant rotation—which is to say, it was The Legend of Sleepy Hollow that gave me my first and most frequent childhood panic attack. After my dad read to me that "the world did absolutely turn round, and that [we] were half the time topsy-turvy!" I started complaining regularly of being dizzy. "Dizzy" became a catchall word for any kind of nervousness or anxiety I was having. My dad started calling me "the dizzy dame" and "canary"—short for "canary in a coalmine," a song that we played a lot in my house, and a euphemism for someone who is overly-sensitive to their surroundings. The song has the line "you get so dizzy even walking in a straight line," which seems fitting, too. My first heartbreak at age 15 dictated my musical taste for the rest of my high school career, which makes choosing a song difficult. I remember, after this first heartbreak, feeling very keenly the loss of some essential part of myself—an innocence, yes, but a basic certainty about who I was, too. At night I would listen to this song on my Discman over and over again, buried underneath my covers—rewinding the line "he washed me ashore, and he took my pearl, and left an empty shell of me" until it became a kind of mantra. One of the things that pulled me out of my own sullen girl phase was my mom leaving Daphne Du Maurier's Rebecca on my pillow one night. Reading the book was the only thing that distracted me from my own angst. Once I finished I felt more like myself again (and swapped "Sullen Girl" for Ani DiFranco's "Not a Pretty Girl"—anger is easier than sadness). In college I worked in a coffee shop in the West Village with a girl named Elise who was from the Midwest. She told me horror stories about the food she ate growing up—Jell-O pretzel "salads" and something called "city chicken" that was actually pork. She gave me a copy of The Corrections, a novel set in the Midwest that is haunted by disgusting food, to back up her claims. This coffee shop, like most I've worked in, was staffed with people who cared very deeply about obscure music. After long days of listening to industrial noise rock and Gregorian chants the only music I wanted to hear was something with a beat that I could follow. I listened to Hell Hath No Fury a lot that year on my iPod, and "Ride Around Shining" got the most plays. I wrote an essay in Voracious about when I moved to Brooklyn almost nine years ago. The apartment was in absolute shambles, and I spent my first couple of weeks on my hands and knees scrubbing away mysterious stains, stuffing Brillo pads in mouse holes, and laying roach traps. There is a ton of music that reminds me of this time, but most of my time spent cleaning and wandering around my new streets had Neko Case playing in the background. A lot of this time was also spent comparing myself to (and envying) my peers, most of whom had good, stable jobs and clean apartments, which makes "Margaret v. Pauline" the most fitting song choice. Land of Talk—"Some Are Lakes"
About five years ago, after a long winter working at a job that I hated and living in an apartment with no heat, I traveled to California for the first time. I stayed for ten days and returned even more depressed than when I'd left, wondering in a real way for the first time if it was time to leave New York. It was at this time that I read Joan Didion's "Goodbye to All That," but instead of convincing me that it was time to leave New York, it somehow renewed my love of the place. During this period, I was listening to one album pretty much exclusively—Land of Talk's Some are Lakes. For some reason the album downloaded onto my iPod out of order, so the first song that played was always the title track, "Some Are Lakes," and it never ceases to amaze me how immediately the opening note of the song alone can bring me back so completely to that point in time. Japandroids—"The House That Heaven Built"
George Orwell's book inspired a recipe for bone-in ribeye steak, so it feels natural to connect it to the years I spent at The Meat Hook, where I learned how best to cut and cook a ribeye. Many albums remind me of my time there—Robyn's "Body Talk," Catcall's "The Warmest Place," any and all Taylor Swift (no? not what you were imagining?). But no album will ever remind me more of my time at The Meat Hook than Japandroids' Celebration Rock, specifically the song "The House That Heaven Built." Much of Orwell's Down and Out in Paris and London is about the interior life of a professional kitchen—the camaraderie and drama and sweat—and even though The Meat Hook isn't technically a restaurant, we shared all of that there. When I was a kid, one of my biggest anxieties (besides the earth being in constant rotation) was that someday every combination of musical notes would be exhausted and that new music would cease to exist. I can't explain where this came from, but as an adult, and a writer, I experience a similar kind of fear when my brain is exhausted and blocked and it seems impossible to write anything that hasn't already been written. Rumors about Donna Tartt's writer's block-induced mental breakdowns swirled around during the many years between her first and second novels, but in an interview, Tartt addresses this very simply. "Good writing," she says, "takes time." Eliot Sumner is an artist I've been following since I happened upon one of her concerts in 2009 or ‘10. After getting a lot of buzz around that time, she disappeared completely and reemerged only recently with a completely different sound. I listened to her EP, Information, constantly after I turned in the first draft of my book. I was feeling really strange and hollow, and even though it's a dark album—"Wobbler" in particular is a dark song—it always made me feel better.